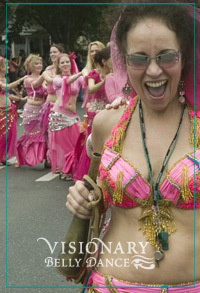 This is the last year that VDP Studio will do a Big event in the Solstice Parade. Please Join us so we can go out with a Big bang of Glory!! If finances are a concern for you as a dancer see our stimulus program web page>>. Know this; the parade class series is a big bang for your buck. June 30 After Party at Delilah’s with Videos and photo share! The fees go for teacher fees for teaching and producing all these events and intellectual property, studio overhead, airfare for our guest instructor, building a wheeled conveyance for sound amplification, a generator for powering sound, airfare, food and lodging for guest artists costume and building supplies. This is a huge expense list. Happily this year and we received $800 from the Fremont Arts Council to help with this. We still will be scrambling for the rest and being very resourceful. Please help if you can with ideas, loan of stuff, funding, time and expertise. at the Asian art Museum on Saturday May 5th.